Make a donation to the Maggie May Memorial Account for a chance to win it! 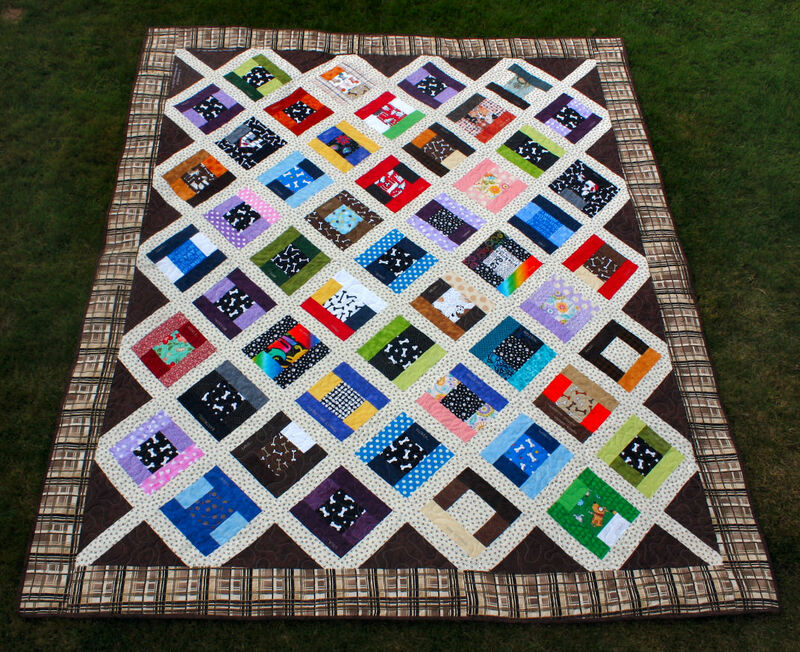 We have named our first anniversary quilt “GRATITUDE”, in recognition of the enormous support and encouragement we have received from so many…. Dr. Maja and the crew at Healing Paws, our followers, those that have donated, received a blanket, a bandana, and even a belly band. We thank you all for helping us make a difference! We knew that when we launched “In Memory Of Maggie May” that we would be doing an anniversary quilt. In May, we started creating and piecing it together, it was just a few days ago that we finally finished it. We incorporated all the fabrics and pet names of quilts we have created since we launched in October 2013 to April 2014. 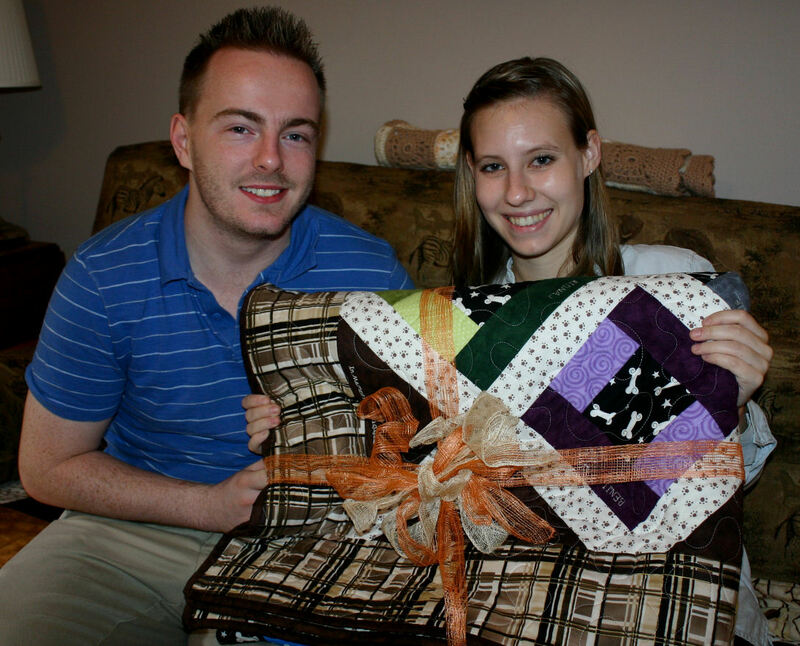 It was truly a labour of love, we knew the blankets by the pets name, and we had a lot of fun making it. Although it will be bittersweet to send it on to it’s new home, we could not be more excited to let it go. We would like to send a special thank-you to Tammy Howard of Sugar Town Quilting Co, in Cranbrook for donating her time and cost to professionally quilt our creation. We included 54 pet names & 49 mini quilts : Midna, Angus, Bella, Kaia, Benji, Buddy, Bella, Rum Toddy, Daily, Louie, Timbit & Linden, Salsa, Denver, Salsa, Apollo, Rudy, Rosie, Rio, Jackie, Saints, Hannah, Jane, Cujo, Mark, Louie, Bella, Joker, Madison, Sancho, Salsa, Jackie, Saints, Keoke, Reggie, Madison, Salsa, Eastwood, Timbit & Linden, Maggie, Tucker, Juniper, Slipper, Mocassin, Amy, Cabo, Tucker, Bandit, Healing Paws, Mojo, Lola, Maggie Mae, Charlie. Our goal is to raise $1500+ for the “memorial account”.